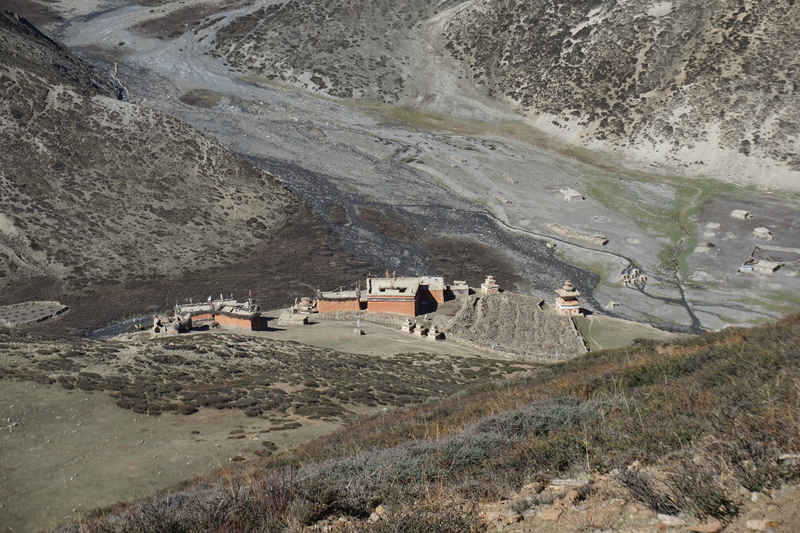 Coordinates of the site: 29°21’8.81” northern latitude and 82°57’56.07” eastern longitude, at an altitude of 4345 meters. 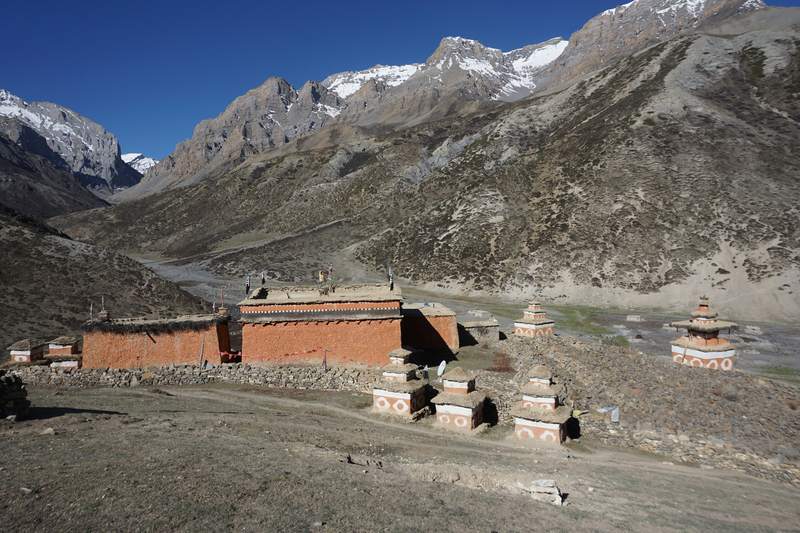 The Monastery of Shey Sumdo is situated north of the Phoksundo Lake and the Phulbari-La in Upper Dolpo, named after the river valleys that converge here. 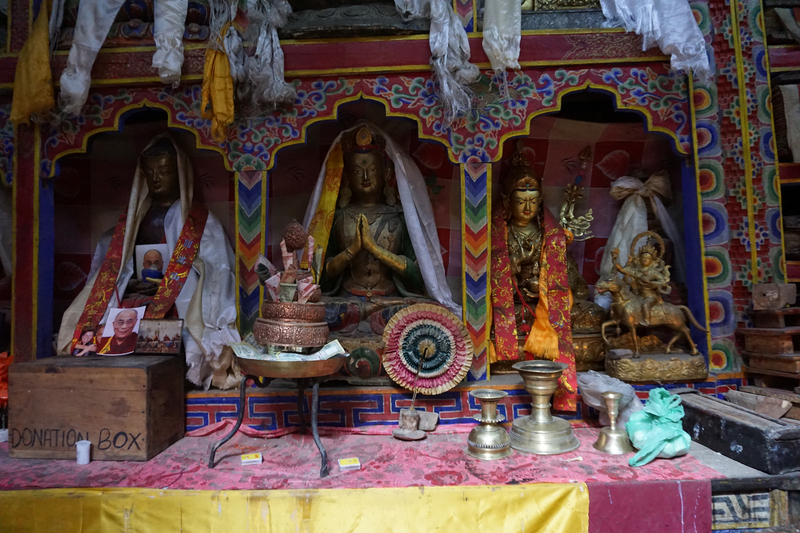 The place is considered to be the most sacred centre of Dolpo for both the Bon and Buddhist inhabitants. 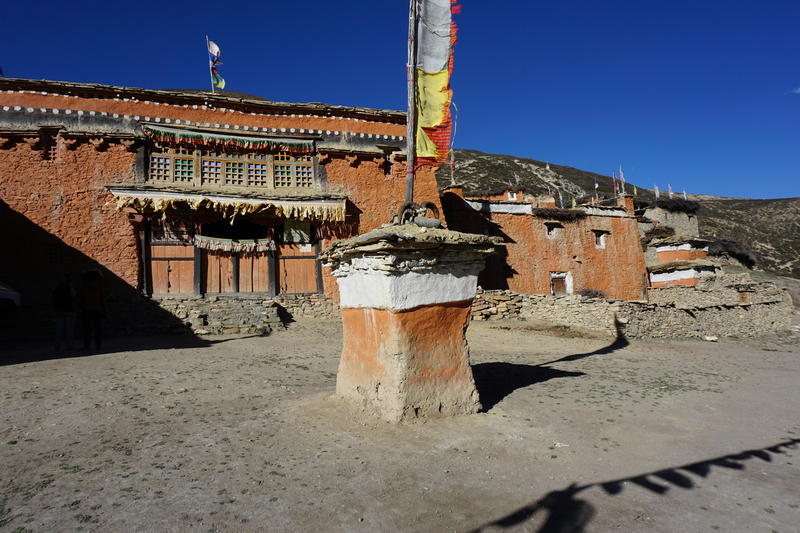 It was founded in the late 17th century by Lama Tenzin Räpa of the Buddhist Kagyü tradition. 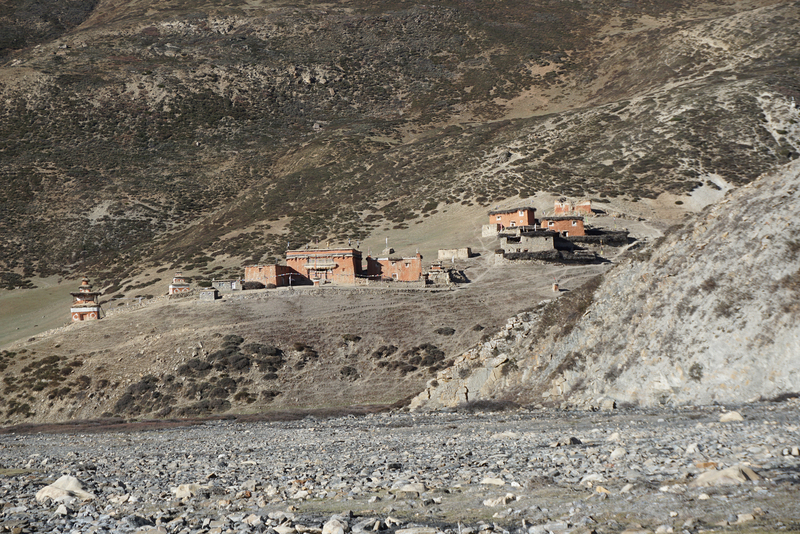 Shey Monastery stands just above the river-junction. It is an impressive collection of redwashed buildings surrounded by prayer walls and chörten. 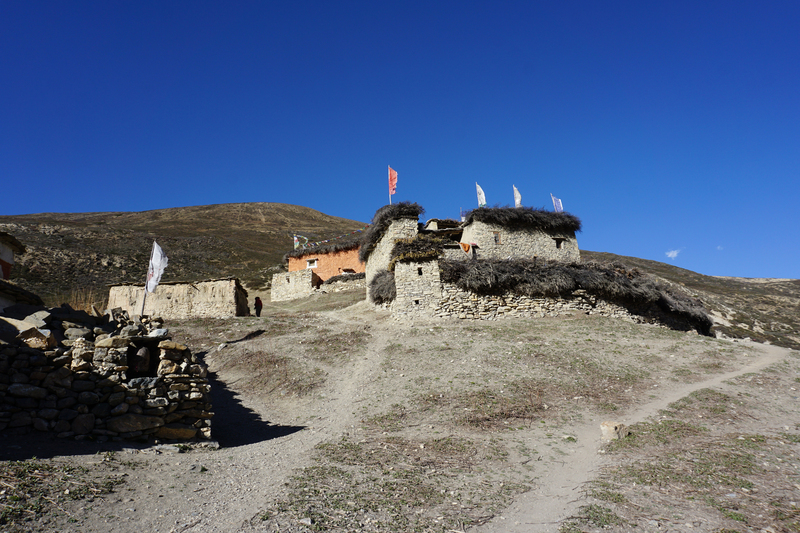 The ensemble consists of a two-storeyed temple, which is flanked by two lower buildings (common rooms or residential houses), right beside a huge field of mani- and matri-stones. The entrance of the temple faces southwest, where a common forecourt is situated. 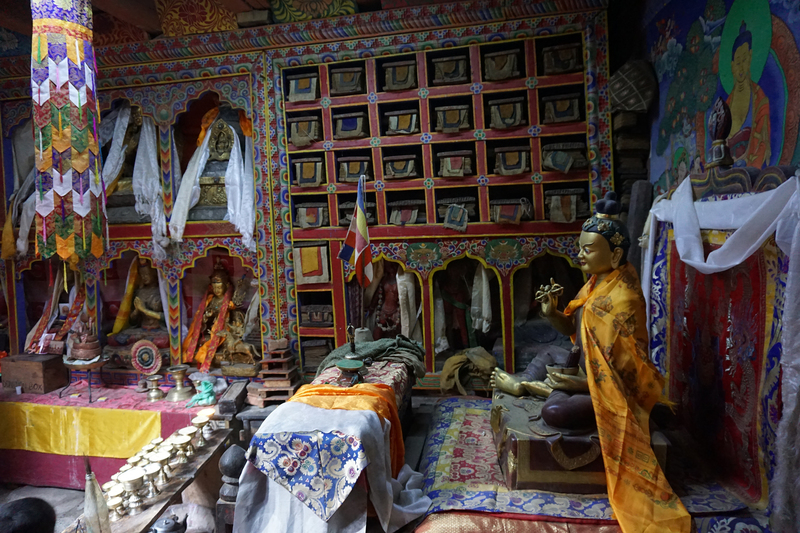 Through an entrance hall with a mani chapel one can reach the temple interior that measures 15.0 x 16.0 m. Four wooden pillars support the ceiling. The main altar flanked by bookshelves is located in the rear part of the room opposite the entrance. 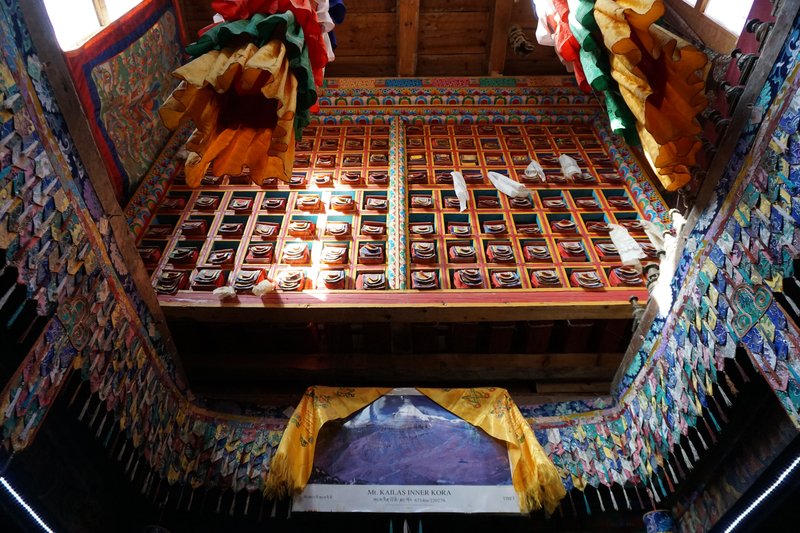 The walls are covered with murals, in front of the sidewalls further altars are placed. In the centre of the ceiling a lantern with a window lights up the interior and shows another huge bookshelf which can be accessed from upstairs. 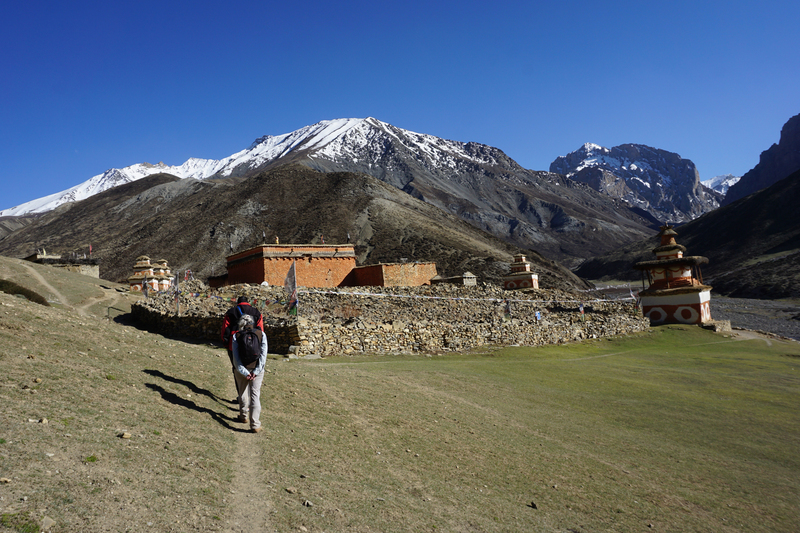 The circumambulation path (kora) leads around the temple buildings and the mani field, where chörten of different sizes are located. 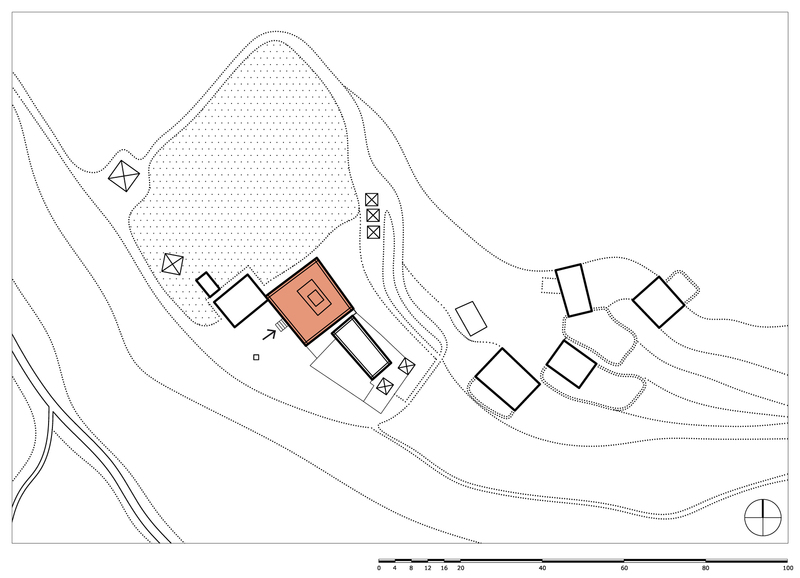 Four residential houses are situated in the east of the temple, three more can be found on the northern slope of the hill. 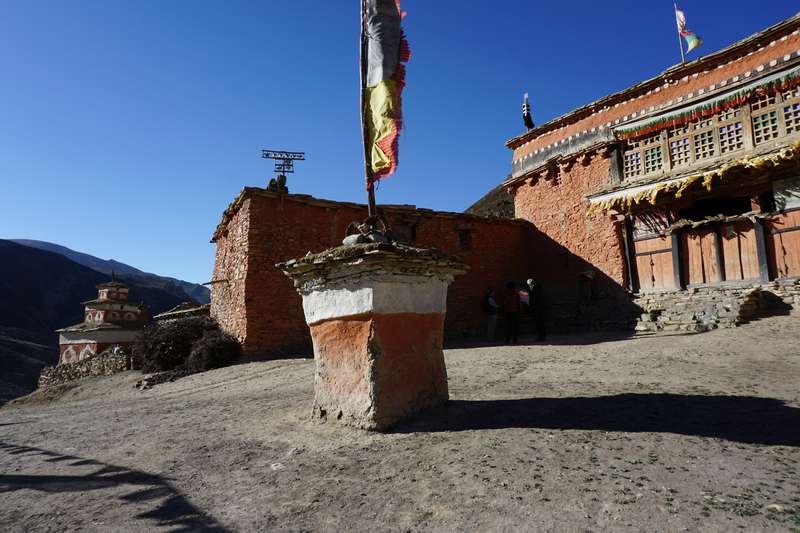 Directly on the west side, a large meadow adjoins the temple area providing enough space for large assemblages of pilgrims who come annually or at least every twelve years in the Dragon Year. 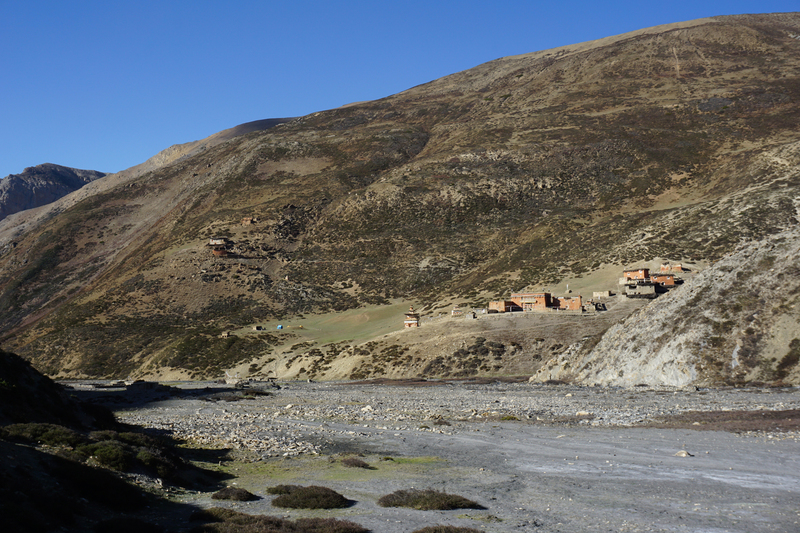 At the foot of the temple area, directly in front of the bridge that leads from the river valley up to the monastery, an impressive group of Tibetan watermills can be found. 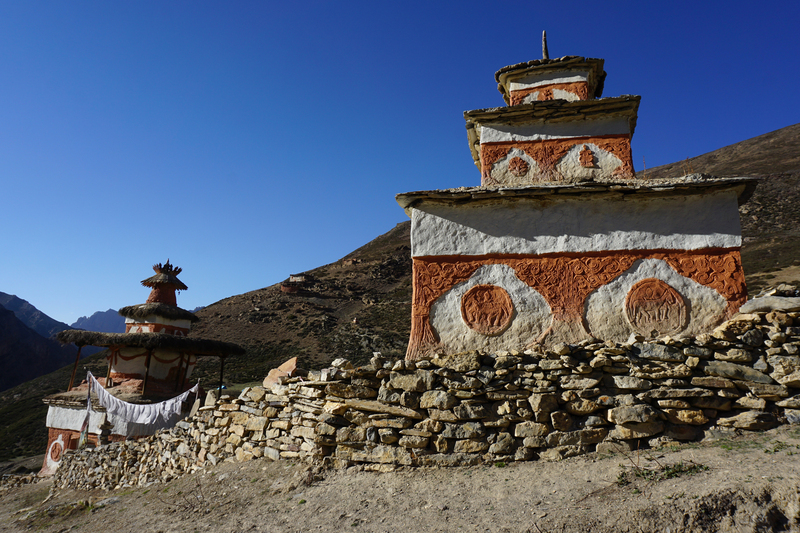 Mani-stones are Stones with inscriptions of sacred syllables of Buddhism, matri-stones with syllables of Bon, see Kind 2012, p. 427. Different types of chörten next to the mani-field. Auer 2018.